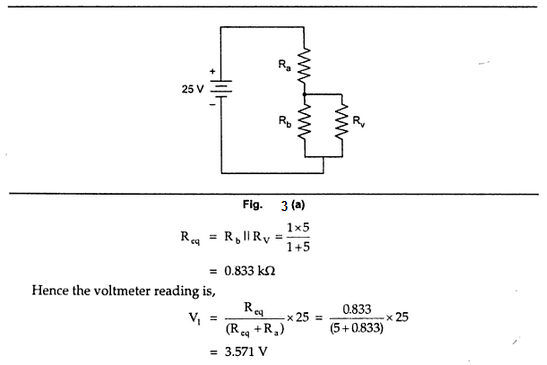 In a multirange voltmeter, the ratio of the total resistance RT to the voltage range remains same. This ratio is nothing but the reciprocal of the full scale deflection current of the meter i.e. 1/Im. 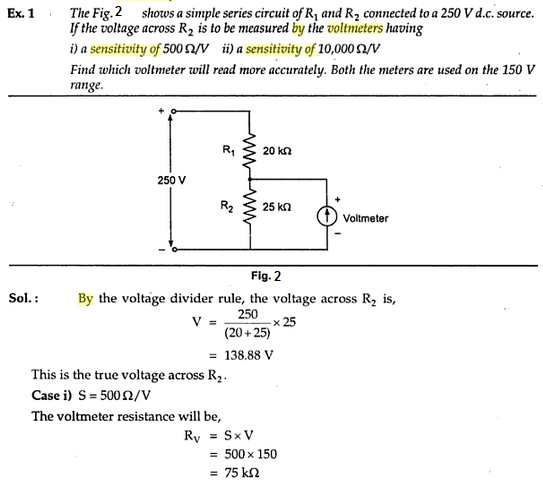 This value is called sensitivity of voltmeter. The sensitivity range is specified on the meter dial and it indicates the resistance of the meter for a one volt range. 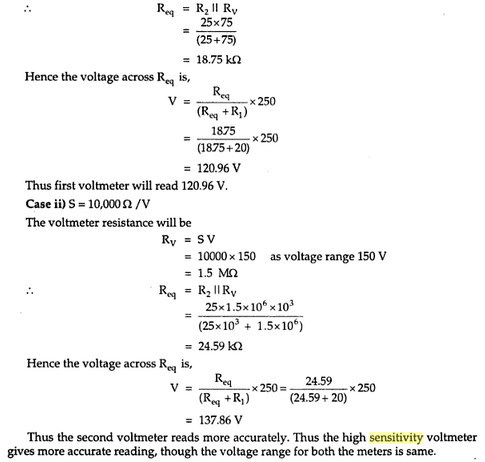 The sensitivity is useful in calculating the resistance of a multiplier in d.c. voltmeter. 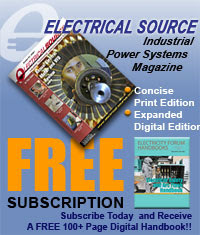 Consider the practical multirange voltmeter circuit shown in the Fig. 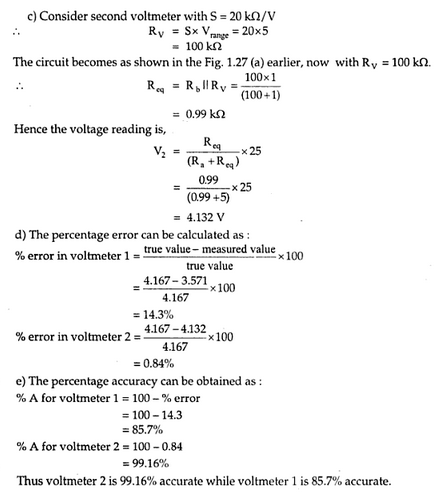 1.
where v1, v2, v3 and v4 are the required voltage ranges. This method is called the sensitivity method of calculating the multiplier resistances. While selecting a meter for a particular measurement, the sensitivity rating is very important. A low sensitive meter may give the accurate reading in low resistance circuit but will produce totally inaccurate reading in high resistance circuit. 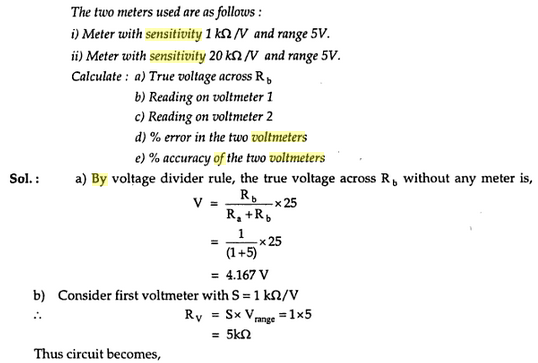 The voltmeter is always connected across the two points between which the potential difference is to be measured. If it is connected across a low resistance then as voltmeter resistance is high, most of the current will pass through a low resistance and will produce the voltage drop which will be nothing but the true reading. But if the voltmeter is connected across the high resistance then due to two high resistances in parallel, the current will divide almost equally through the two paths. Thus the meter will record the voltage drop across the high resistance which will be much lower then the true reading. Thus the low sensitivity instrument when used in high resistance circuit gives a lower reading then the true reading. This is called loading effect of the voltmeters. It is mainly caused due to low sensitivity instruments. 1) The voltmeter resistance is very high and it should always be connected across the circuit or component whose voltage is to be measured. 2) The polarities must be observed correctly. The wrong polarities deflect the pointer in the opposite direction against the mechanical stop and this may damage the pointer. 3) While using the multirange voltmeter, first use the highest range and then decrease the voltage range until the sufficient deflection is obtained. 4) Take care of loading the effect. 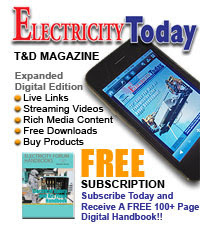 The effect can be minimised by using high sensitivity voltmeters. 1) Their resistance should not change with time. 2) The change in their resistance with temperature should be small. 3) They should be non-inductively wound for a.c. meters. Commonly used resistive materials for construction of multiplier are manganin and constant.